According to your requirements, our Polypropylene honeycomb Core products can be processed into various sandwich panels. Clients can choose a Polypropylene Honeycomb or Polycarbonate Honeycomb for the core. Also different surface materials are available, such as steel, aluminium, wood, reinforced fiber glass, etc. 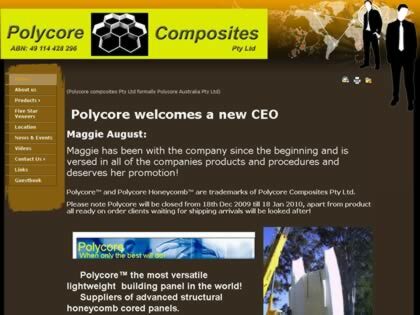 Web Site Snapshot: If available, above is a snapshot of the Polycore Australia Pty Ltd web site at http://www.polycore-australia.com.au as it appeared when this site was added to the directory or last verified. Please Note that Boat Design Net has no involvement with the above web site; all content and images depicted in the above thumbnail are the property and copyright of Polycore Australia Pty Ltd unless otherwise noted on that site. Description: According to your requirements, our Polypropylene honeycomb Core products can be processed into various sandwich panels. Clients can choose a Polypropylene Honeycomb or Polycarbonate Honeycomb for the core. Also different surface materials are available, such as steel, aluminium, wood, reinforced fiber glass, etc.